Learning that you have idiopathic pulmonary fibrosis (IPF) is a life-changing event. It means you have a type of chronic lung disease that can be expected to get worse over time. It often causes significant and progressive dyspnea (shortness of breath), fatigue, and cough, symptoms that can become quite limiting; and it is likely to eventually cause death. However, people who have IPF actually have quite a lot to say about how well (or how poorly) they will do with this condition. The people who fare the best with IPF are most often the ones who take an active role in managing their own condition. They will try to understand as much as they can about IPF and the available treatments, and will take an active role in deciding which treatments are most suitable for them. They will incorporate all the lifestyle changes that have been shown to reduce symptoms and prolong survival. And they will make sure that they and their doctors are keeping a close eye on the active, ongoing research that is taking place, aimed at developing new, effective treatments for IPF. IPF is caused by abnormal fibrosis (scarring) of the lung tissue. Because of this fibrosis, the lungs become inefficient at exchanging gasses between the air in the alveoli (air sacs) and the bloodstream. As a result, oxygen has a harder time getting into the bloodstream. As the fibrosis worsens, so does dyspnea and the other symptoms IPF often causes. Our ideas about the cause of this progressive lung fibrosis have been evolving in recent years. Originally it was believed that the lung scarring was caused by inflammation in the lung tissues, and treatment was aimed at interfering with the inflammatory process with drugs such as steroids, methotrexate, and cyclosporine. However, this type of treatment was never shown to be of great benefit. More recently, most researchers have come to believe that the chief problem in IPF is that the lung tissue simply heals abnormally. This abnormal healing, and subsequent fibrosis, may occur in response to relatively minor lung damage, even the trivial kind of lung damage that occurs with normal living. This concept of abnormal healing in IPF is important because it has given researchers a new target for therapy, namely, finding ways to interfere with the abnormal healing process in order to limit fibrosis. While the healing process in lung tissue is amazingly complex, and involves interactions between a host of various types of cells and molecules, a lot or progress has already been made. Two new drugs have already been approved thanks to this new line of research (pirfenidone and nintedanib), and several other drugs are currently being developed and tested for the treatment of IPF. The main thing to keep in mind is that there is more reason for optimism regarding treatment for IPF than there ever has been before. And if you have IPF, the more you can do to help slow the progression of the disease, the better your chances of eventually benefitting from new therapies that are likely to become available in the coming years. IPF can be a difficult disease for a doctor to manage. Because it is so complex, and because the optimal management of IPF often involves making critically important decisions at just the right time, people with IPF usually have the best results when they are being cared for by someone who is used to dealing with this disease. So if you have IPF you should strongly consider working with a pulmonary medicine specialist; better yet, a pulmonary specialist who has a particular interest in IPF. You should ask your doctor for a referral to such a specialist. If you are having trouble finding a pulmonary specialist, the Pulmonary Fibrosis Foundation website can help you locate one who is relatively close to your home. A specialist will be particularly helpful in deciding whether you ought to be receiving the newer medications for IPF, and when the best time would be to start them. Also, should lung transplantation ever become a consideration, a pulmonary specialist will be able to judge the optimal timing for such a procedure, and to guide you through the complex process of obtaining it. A pulmonary specialist, especially one with a special interest in IPF, will keep abreast of the latest research in the treatment of IPF, and may even be able to recommend specific clinical trials for you to participate in, if you are interested. ClinicalTrials.gov can also provide this kind of information for you. Take steps to limit further lung damage. Stop smoking. Smoking tobacco products is a cause of steady irritation and damage to your lung tissue. People with IPF who have smoked, and especially those who continue to smoke, have a significantly worse prognosis than non-smokers. It is imperative that you not smoke, and that anyone who lives with you also not smoke. If you do smoke, learn what you can do to quit smoking. Get vaccinated. You should do everything you can to avoid contracting pneumonia or other lung infections. This means getting yearly influenza vaccines, and getting vaccinated for pneumococcal pneumonia. Strongly consider being treated for GERD. Gastroesophageal reflux disease (GERD) is a frequent cause of heartburn. It turns out that esophageal reflux is quite common in people with IPF. In many of these people, the GERD is not causing any noticeable symptoms—but it is still happening. During these reflux events (whether they produce symptoms or not) a small amount of stomach acid commonly gets into the lungs, producing what (in people without IPF) is trivial and transient lung damage. In those with IPF, however, this trivial lung damage is converted to worsening lung fibrosis. For this reason, many specialists believe that almost anyone with IPF should be placed on treatment for GERD, whether they have symptoms of reflux or not. You should at least discuss this treatment option with your doctor. Oxygen therapy. 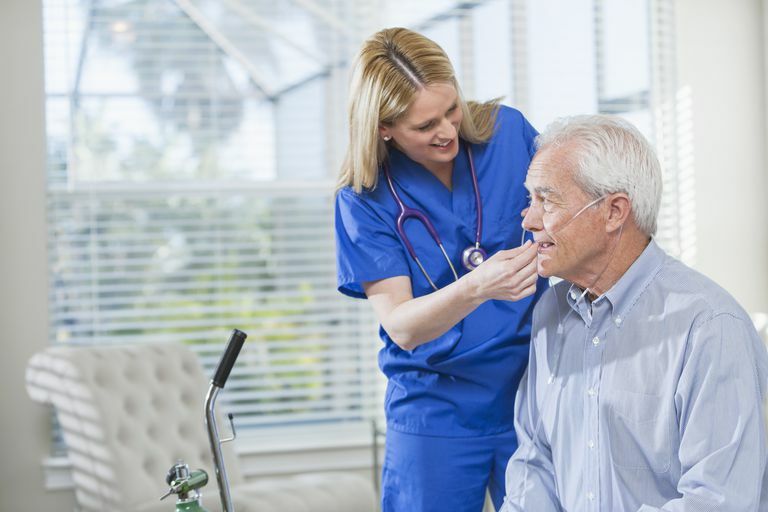 Supplemental oxygen is very helpful in people with IPF, and you should discuss this treatment with your doctor. People with IPF usually find they are able to perform more exercise if they use oxygen during exertion. As the disease progresses, continuous oxygen therapy can greatly relieve symptoms of dyspnea at rest. Furthermore, oxygen therapy can help to prevent the onset of pulmonary hypertension, which commonly occurs in IPF. Pulmonary rehabilitation program. Participating in a pulmonary rehabilitation program, similar to those employed in people with chronic obstructive lung disease, is quite helpful in people with IPF. These programs include exercise training, training in breathing techniques, emotional support, and nutritional advice. All of these aspects of pulmonary rehab help to reduce symptoms and improve the prognosis of people with IPF. You should ask your doctor to refer you to one. Nutritional diet. Maintaining sufficient nutrition is very important to improving your outcome, but eating well can be a challenge if you have IPF. You should aim for a diet that includes lots of fruits, vegetables, and lean meats. Eating smaller, more frequent meals is often easier in people with IPF than eating larger meals. A dietician can be very helpful in coaching you in how to get the nutrition you need. Support groups. Joining in a support group can be quite helpful. It is useful to know there are other people out there experiencing the same problems you are having. Interacting with them, and learning how they have coped (and helping others to cope) can be quite empowering and uplifting. Your pulmonary specialist should be able to recommend a local support group. The Pulmonary Fibrosis Foundation can also help you find one in your area. IPF is a serious condition with serious consequences. Still, a person with IPF has more reason for optimism today than ever before, especially if he or she is receiving expert medical care and is taking an active role in doing all the things that can help to maintain their health. Collard HR, Tino G, Noble PW, et al. Patient Experiences with Pulmonary Fibrosis. Respir Med 2007; 101:1350. Dowman L, Hill CJ, Holland AE. Pulmonary Rehabilitation for Interstitial Lung Disease. Cochrane Database Syst Rev 2014; :CD006322. Lee JS, McLaughlin S, Collard HR. Comprehensive Care of the Patient With Idiopathic Pulmonary Fibrosis. Curr Opin Pulm Med 2011; 17:348. Raghu G, Collard HR, Egan JJ, et al. An Official ATS/ERS/JRS/ALAT Statement: Idiopathic Pulmonary Fibrosis: Evidence-based Guidelines for Diagnosis and Management. Am J Respir Crit Care Med 2011; 183:788. Can Alternative Medicines Help You Cope With Pulmonary Fibrosis?